I recently made my record 10th appearance on the Amateur Traveler Podcast with my This Week in Travel co-host, Chris Christensen. This time I was there to talk about my recent trip to Israel and Palestine, and their UNESCO World Heritage Sites. I recently had my 9th appearance on the Amateur Traveler podcast. This time I spoke about the UNESCO World Heritage Sites of Canada. There are 17 and as of 2014 I have been to all of them. Last summer I did an island hopping tour of the Lesser Antilles in the Caribbean. I recently did two appearances on the popular Amateur Traveler podcast with my friend Chris Christensen to talk about my trip. 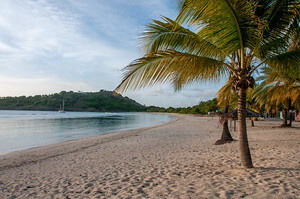 Because there were so many islands, we split the interview into two with the first half talking about the Leeward Islands (USVI, BVI, St Martin, Saba, St Eustatius, Anguilla, St Bart’s, St Kitts and Nevis, Antigua and Barbuda, and Montserrat) and the Windward Islands (Guadeloupe, Dominica, Martinique, St Lucia, Barbados, St Vincent and the Grenadines, Grenada, and Trinidad and Tobago). This was actually my 6th and 7th appearance on the show, going all the way back to 2008. I always tend to talk about tiny countries. My previous episodes include the micro-states of Europe, the Canary Islands, UNESCO World Heritage Sites, the Persian Gulf States, and Micronesia region. If you don’t subscribe to the Amateur Traveler, you really should. It is one of the best travel podcasts on the Internet. Chris Christensen, my co-host of This Week In Travel, is also the man behind the Amateur Traveler Podcast, one of the most popular travel podcasts on the internet. I recently did my 4th appearance on the show talking about the micro-states of Europe: Monaco, San Marino, Liechtenstein, and Andorra. My previous appearances include interviews on Micronesia, the Persian Gulf States and UNESCO World Heritage Sites. This week I did an interview with my This Week In Travel co-host Chris Christensen on the Amateur Traveler Podcast about UNESCO World Heritage Sites. This was my third time on the show. In my previous two appearances I talked about Micronesia and the Persian Gulf.